Rainwater Harvesting is a membership category of Irrigation Australia and is designed for members engaged in rainwater harvesting activities including the supply of products and advice and includes the previous members of the Rainwater Harvesting Association of Australia. Rainwater Harvesting is rainwater captured from a roof into a container. Rainwater Harvesting has a triple benefit in urban areas. Rainwater harvesting reduces the costs of water infrastructure across the urban system. Rainwater harvesting with water efficient appliances reduces household expenditure on water. Rainwater harvesting reduces stormwater management costs. Rainwater Harvesting is the third largest source of water in Australia, after surface water (dams) and groundwater. Rainwater Harvesting provides an independent estimate of 274 billion litres annually. According to the ABS one in four, or 26% of Australian houses have a rainwater tank. The ABS estimate rainwater provides 177 billion litres, or 9% of residential water in Australia worth $540 million. Outside of urban areas rainwater provides 63% of residential water or 109 billion litres. Rainwater harvesting is the first and most efficient element of an integrated water management system. Because rainwater falls on roofs it is a local supply that can be collected where it is needed. Because rainwater Is usually high quality it can meet significant local water demand until it runs out. Capturing rainwater reduces the negative impacts of urban water on natural catchments. Coombes and Smit estimated savings from rainwater harvesting and water efficient appliances in 2016 in Sydney alone of 90 billion litres annually, equivalent to the entire capacity of the Sydney $1.8B desalination plant. Rainwater Harvesting is the most accessible source of water in Australia. All urban areas continue to enjoy rainfall even in a drought, however, rainwater harvesting continues to provide water long after natural catchments become too dry for stream runoff. Desalinated water is not dependent on natural rainfall but it does rely on an electricity network, water distribution system and high levels of public expenditure. Irrigation Australia as a registered training organisation (RTO) runs a number of nationally accredited training across Australia including Certificate III in Irrigation. Irrigation Australia will be running a number of Rainwater Harvesting training, workshops and events in the next period. 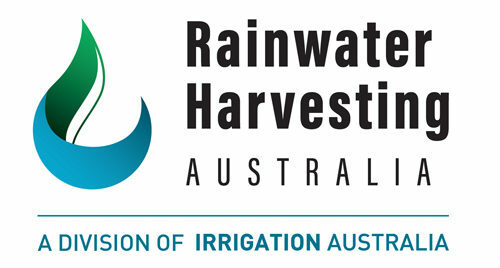 Join Irrigation Australia and support Rainwater Harvesting in Australia. Ensure that every rainwater tank supplied & installed meets minimum industry standards.